Lieutenant Dougal Clifford Campbell Sewell. Unit: 3rd Battalion attached to 1st Battalion, Queen’s Own (Royal West Kent Regiment). Death: 10 September 1914 Wounded at Mons on 23 August 1914 died in Colliery Hospital at Wasmes Western Front. He was 20. LIEUTENANT DOUGAL CLIFFORD CAMPBELL, 3RD (attd. 1st) BATTALION QUEEN’S OWN (ROYAL WEST KENT REGIMENT), was the fourth son of Mrs. William Sewell, of Annandale, West Byfleet and the late William Sewell, J.P., of Tillingham, Essex, and was born at Tillingham Hall. He was wounded at Mons on the 23rd August, 1914, and died in Colliery Hospital at Wasmes a few days later at the age of twenty. He was educated at Wellingborough School, where he made the reputation of an athlete. He was in the Shooting VIII and the Football XI, and for three seasons was the captain of the Cricket XI. In cricket he had an aggregate of 617 runs in thirteen innings, and during his captaincy his XI was accepted as being one of the strongest Public School teams in the field. He also made a school record in athletics in his last term by winning no fewer than six events: the one hundred yards, one hundred and twenty yards, quarter mile, long jump, high jump and throwing the cricket ball. He was known to all his friends as “Dougal”, and at school was beloved by both masters and boys. He joined the army in September, 1912, becoming Lieutenant in the 3rd Royal West Kent Regiment in July, 1913. In the Army, no less than at school, he was very popular with all ranks, officers and men. 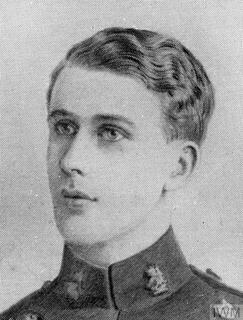 LT. DOUGAL CLIFFORD CAMPBELL SEWELL, of the 1st Batt. Royal West Kent Regt., died in September of wounds received near Mons. He was in the Wellingborough XI in 1911 and 1912 and was only twenty years of age at the time of his death. In 1912 he was second in the School averages with 47.46 for an aggregate of 617. He was considered a fine natural hitter. 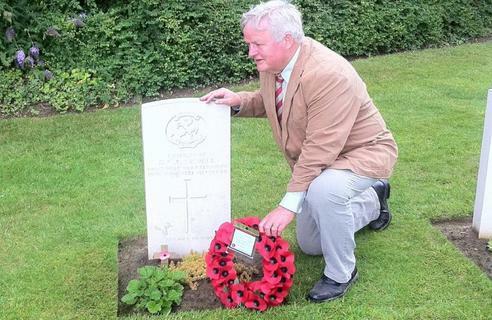 On Friday 4th July 2014 and in remembrance that the First World War which started almost 100 years ago, Colonel Bob Stewart DSO, MP MP for Beckenham visited several First World War Military Cemeteries in Belgium. In particular he sought the last resting places of officers and soldiers of our local regiment, The Royal West Kent Regiment. The photograph shows him at St. Symphorian First World War Military Cemetery and the grave of twenty year old Lieutenant D.C.C, Sewell who died on 10th September 1914.